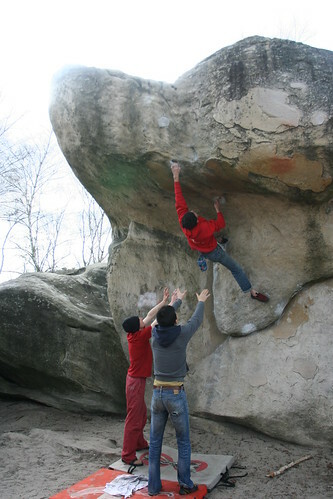 One of the most famous boulder problems at Fontainebleau. This former aidroute (one can see still the pitons) was first free climbed in 1978 by Eric Boucher and Jo Montchaussé. Today it's still good fun on jugs, but more than one was a bit trembled with fear as the top out is at 4,5 m above the ground.